The Organic Act (enacted April 30, 1900) established the territorial status of the Islands; with it, the legislature was authorized to create towns, cities and counties within the Territory. In 1905, the Territorial Legislature passed “The County Act” (Act 39) which formed the basis of modern local government in Hawaiʻi. It established five counties: Kaua‘i, O‘ahu, Maui, Hawai‘i and Kalawao. Hawai‘i’s 5th County (encompassing the Kalaupapa Peninsula and surrounding land) remains under the jurisdiction of the state’s Health Department; the other four counties were governed by elected Boards of Supervisors. Contrary to the suggestion in the name of the enabling “County Act,” State government retained many traditional county government functions and over the next many decades took on even more, making Hawai‘i the most centralized state government. The state continued to administer the court system, public health, welfare, correctional and school systems in addition to all harbors, airports and major highways. The County of Oʻahu began operating on July 1, 1905, and two years later was renamed the City and County of Honolulu; it was governed by a Board of Supervisors. Later, a mayor was added to the Board of Supervisors. Honolulu’s first campaign for Mayor had two principal candidates: John Carey Lane, Republican; and James Joseph Fern, Democrat. Joseph Fern was born in Kohala on the Big Island in 1872, to James and Kaipo Fern, a Hawaiian family of modest means. His schooling was rudimentary, and he was commonly referred to as being self-taught. At the age of twelve he went to work for the Union Mill Plantation of Kohala, driving a bullock cart loaded with fire wood from the forests on the upper slopes down to the mill. He left the Big Island in 1892 and headed to Honolulu. In the city, his first job was as a mule-car driver for the Hawaiian Tramways. He eventually worked as shipping master for the Inter Island Steamship Company. 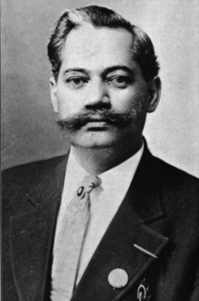 In 1907, Joe Fern was elected to the Board of Supervisors of the County of Oʻahu as a Democrat, one of a minority of three on the seven-man board. In 1915, he lost a reelection bid against John Lane. That year, for the first time, Honolulu’s budget passed the million-dollar mark, the increase reflecting a general growth in property valuations in the city. After leaving office, Fern was appointed City Jailer. When Lane tried to run for reelection, Fern challenged his successor again and won by 300 votes; he retook the Mayor’s office on July 2, 1917. Fern died February 20, 1920 from complications with diabetes, while still in office. Evidence of his popularity among the people he served, Fern was granted a state funeral and was laid in the throne room of ʻIolani Palace. During the burial rites at the Catholic Cemetery, the United States Army Air Corps presented a fly-over ceremony in a V-formation. Fern Elementary School and Playground are named in his honor. The image shows Joseph Fern, Honolulu’s first Mayor (HHS;) in addition, I have added other images in a folder of like name in the Photos section on my Facebook and Google+ pages.